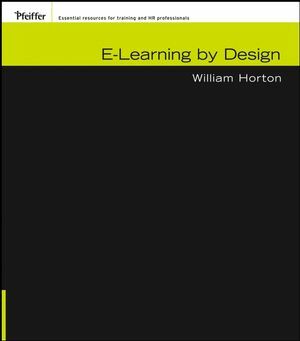 From William Horton -- a world renowned expert with more than thirty-five years of hands-on experience creating networked-based educational systems -- comes the next-step resource for e-learning training professionals. Like his best-selling book Designing Web-Based Training, this book is a comprehensive resource that provides practical guidance for making the thousand and one decisions needed to design effective e-learning. e-Learning by Design includes a systematic, flexible, and rapid design process covering every phase of designing e-learning. Free of academic jargon and confusing theory, this down-to-earth, hands-on book is filled with hundreds of real-world examples and case studies from dozens of fields. William Horton is a leading e-learning consultant and president of William Horton Consulting where he advises large and small companies in developing online training and information strategies. He is the author of Leading E-Learning, Evaluating E-Learning, Using E-Learning, and Designing Web-Based Training and the coauthor of E-Learning Tools and Technologies. Then redesign again and again. Decide why you are testing. Select the right type of question. Consider alternatives to formal tests. Design the components of the topic. Designing lessons as learning objects. Choose the kind of e-learning. Consider alternatives to pure e-learning. 9 DESIGN FOR THE VIRTUAL CLASSROOM. Select and use collaboration tools. The new model of learning.